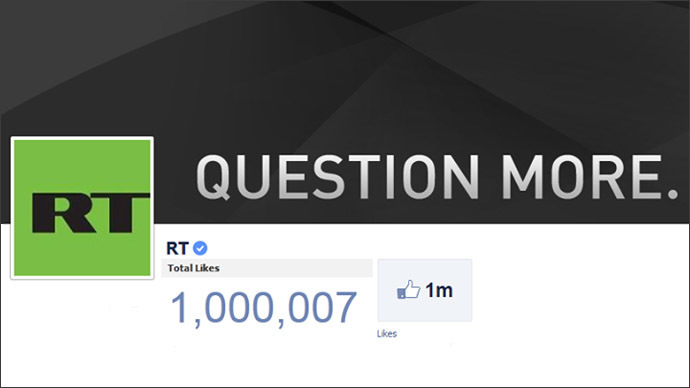 RT’s English language Facebook page has recorded over 1 million likes, following its YouTube success – when it became the first news channel to reach 1 billion views in June. RT’s Facebook page passed the benchmark figure on the evening of August 10, cementing its place among the world’s most popular international news outlets. 2013 has already been a record-breaking year for RT, with its YouTube channel gaining more than 1 billion views, becoming the first news channel to reach this mark. RT’s YouTube page has also recently gained more than 1 million subscribers. The achievement was hailed as a “massive landmark” and a testament to the fact that RT covers relevant topics often ignored by the mainstream media. "The key to success on YouTube is finding your own audience, and RT has managed to create one of the most active news communities on the world’s largest video-sharing website. There is a real person behind every click. We scrutinize carefully the interests, reaction and sentiments of our online constituency," said Kirill Karnovich-Valua, chief editor for RT’s online content. RT has proven to be one of the high-fliers on social media. News guide Newswhip charted RT as 27th among 5,000 English-language newspapers when it comes to attracting likes, shares and comments on Facebook. Following hot on the heels of the success on Facebook and YouTube, RT’s Twitter presence is also growing in popularity, hitting the 500,000 mark last month. Several topics have dominated RT’s social networks in 2013. Namely, the meteorite that exploded over the city of Chelyabinsk in the Urals back in February which picked up over 2 million unique views on the site and over 100,000 likes on Facebook. Moreover, footage of the event achieved a staggering 62,000,000 views on the YouTube channel. More recently, RT’s coverage of NSA whistleblower Edward Snowden’s bid to escape the US extradition order against him has grossed over 6.5 million unique views on RT.com. 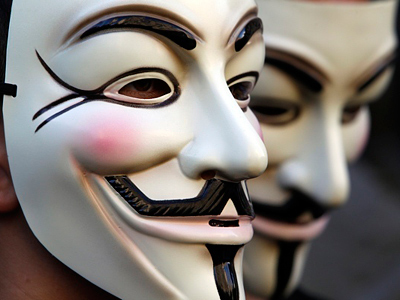 In addition, the civil unrest that drew tens of thousands on to the streets of Turkey in May, protesting the rule of Prime Minister Tayyip Erdogan totted up over 1.5 million hits on RT. 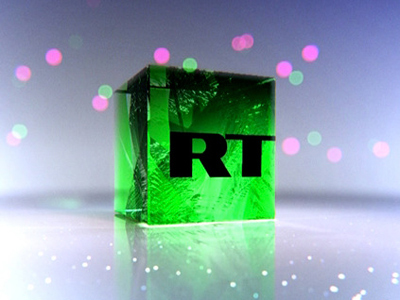 RT is the first Russian media outlet to open its channel on YouTube. 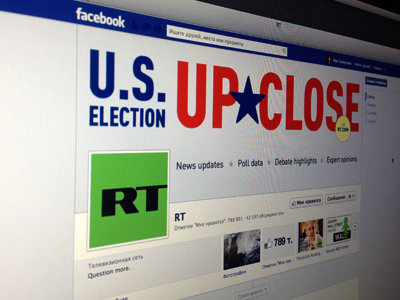 Founded in 2005, the global news network, previously known as Russia Today, has built a large international following. 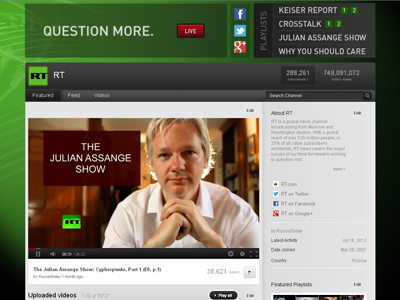 Since 2005 RT has opened three sister channels, broadcasting in Spanish, Russian and in Arabic. The channel broadcasts to 430 million people in more than 100 countries.